With off-the-shoulder silhouettes coming into such popularity this season, there’s now a huge selection (see here) for us aficionados to choose from! That means that I get to be picky whenever I come across the style, unlike last summer where I grabbed anything off-the-shoulder that I could find. So to keep myself from winding up with a closet full of off-the-shoulder, I’ve tempered my taste to select only the most amazing pieces (both in style and cost) that I come across. And this blush top, my friends, absolutely makes my short list. The ruffled neckline immediately sets this beauty part from the myriad of other off-the-shoulder pieces, as well as providing an immediately flattering, unique touch. I adore the billowy, light cut and have found it to add a special flare, making it look far more expensive than it is. Which brings me to my third point… the cost! At $54, this is a piece that you will get so much wear out of, but without the guilt. Something tells me it’s going to sell out quick, so I’d act fast if I were you! I’m in an XS. Happy Friday, friends! I’m so excited to be staying put in Dallas this weekend after what feels like a couple months of non-stop travel! My sister is coming into town from college to celebrate my mama’s birthday, and I couldn’t be more excited. Needless to say, we’ve got lots of shopping, cake-eating and crawfish-boiling ahead! Wishing you all lots of fun and safety! P.S. 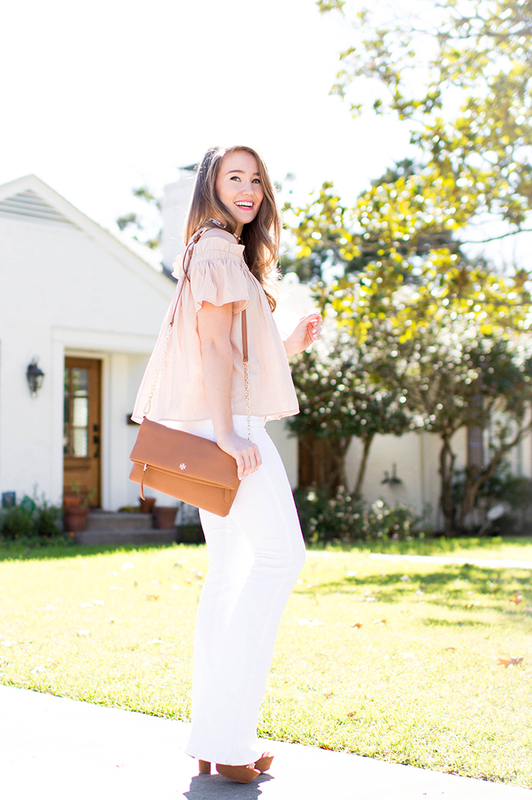 Every girl needs a fab pair of white flare jeans for summer, and the pair I have on in today’s post is under $30, incredibly flattering and great quality! They fit true to size. Go get ’em! 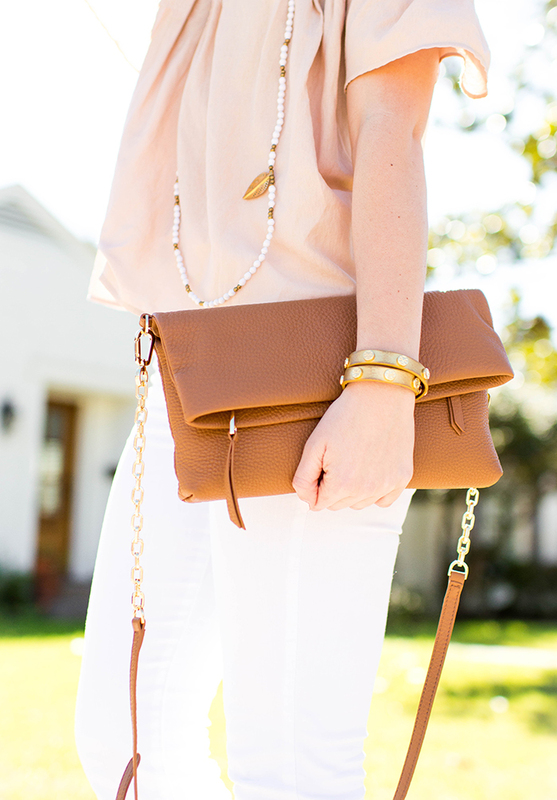 This blush top is absolutely stunning! I love it. Love the wide-legged pants! So in this season. This is so pretty. You are right this shade is totally lady like. I agree the Ruffles really take this top to new heights!! Love this! 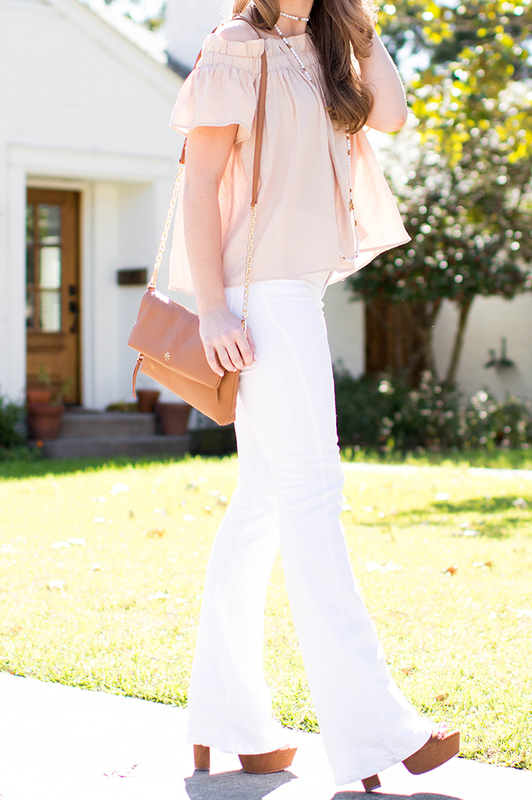 Love the blush color of this top, so feminine and chic! I’m so happy the style is in again this year! What a pretty boho look! I adore the white flared denim! This top is so cute, Kate! I’m so excited for spring! Off the shoulders are everything!! You look stunning. Love the color of this top! You’re right about the off-the-shoulder trend, there is so much more to choose from in that style this year than last, which makes this girl so happy!